Bruny Island (pop ~500) is located in the Kingborough municipality of southern Tasmania. It is accessible by ferry from Kettering, with sailings approximately nine times daily. The Aboriginal name for the island is Lunawannaaloona. It was sighted by Abel Tasman on his voyage to Tasmania in 1642, but the first European to land was the French admiral, Bruny D'Encetastreaux, after whom it is now known. The island is virtually divided in two, with "North Bruny" and "South Bruny" connected by a narrow strip of land. There is a viewing platform on the isthmus which provides not only a view of the land- and seascape but also serves as a lookout for the penguins and muttonbirds which frequent the area. Camel Tours are available, and Barnes Bay on north Bruny provides a good swimming area. On south Bruny, the Adventure Bay Coastal Reserve yields similar benefits. The Bligh Museum, containing historical documents and sketches by Australia's early European explorers, and Aboriginal material, is well worth a visit. Slightly inland is the Waterfall Creek State Reserve. The Bruny Island State Forest and Fluted Cape State Reserve provide for bushwalking, mountain biking and horseriding activities. 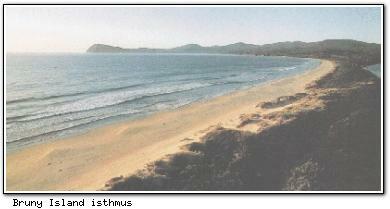 Towards the south and west of south Bruny, Cloudy Bay Beach has good surfing, fishing and swimming. The Labilliardiere State Reserve has a 5-7 hour walk through wildflowers and past sandy beaches. Bruny Island has four 4-star and three 3½-star holiday unit-style accommodations (RACT rated) plus a youth hostel.